After outplaying the Windies in the recently concluded five-match ODI series by 3-1, Team India is currently locking horns with the visitors for the first of the three-match T20I series in Kolkata. After winning the toss, the India skipper, Rohit Sharma decided to bowl first keeping the dew factor in mind and they gave debut caps to Krunal Pandya and Khaleel Ahmed. However, Rohit’s decision was justified in the third over of the match when the Indian pacer Umesh Yadav dismissed Dinesh Ramdin and reduced the Windies to 16/1. Apart from that, the visitors were bundled out for a meager total of 109. However, coming into the chase Team India was also reduced to 57/4 at the end of the 11th over, but in the 12th over men in blue made a comeback when Dinesh Karthik smashed 12 runs off the veteran all-rounder Kieron Pollard. 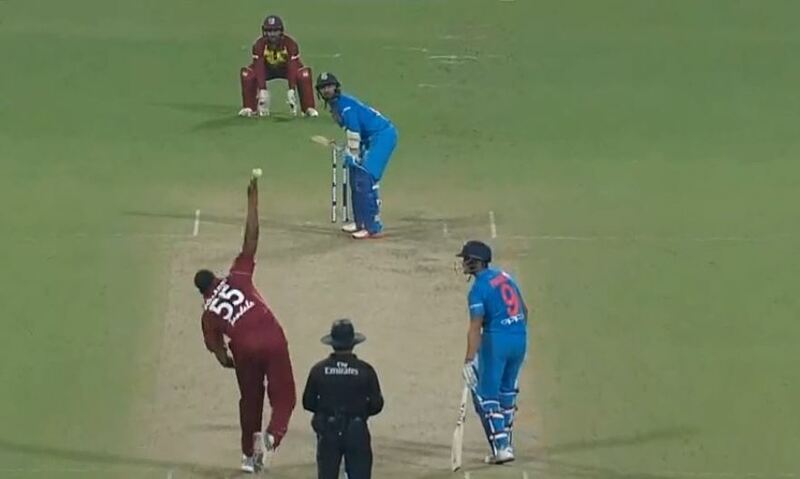 On the first ball of the over, Pollard bowled a friendly delivery on the pads of Dinesh and DK gleefully accepted the gift and tickled it with the angle to the fine leg boundary. He ended the over with two back-to-back boundaries on the leg side. Similar to the first ball of the over, the penultimate ball was again a poor one as Pollard again strayed into the pads and Karthik said, ‘thank you very much’ to the bowler and glanced it to beat the fine leg fielder. On the following delivery, DK played a flat-batted pull to beat Fabien Allen’s dive at deep midwicket. Pollard conceded two fours by bowling full, so drops short, but it was of no use.